This Scottish infantry unit was raised in 1787. It existed until the 1881 Army reforms, when it became part of the Highland Light Infantry. In 1787, faced with a renewed French threat to its Indian possessions, the East India Company raised several new regiments for defence. When that threat failed to materialise, it refused to pay for these units, or for their transportation to India. Instead, they were formed into four line infantry regiments in the British Army. 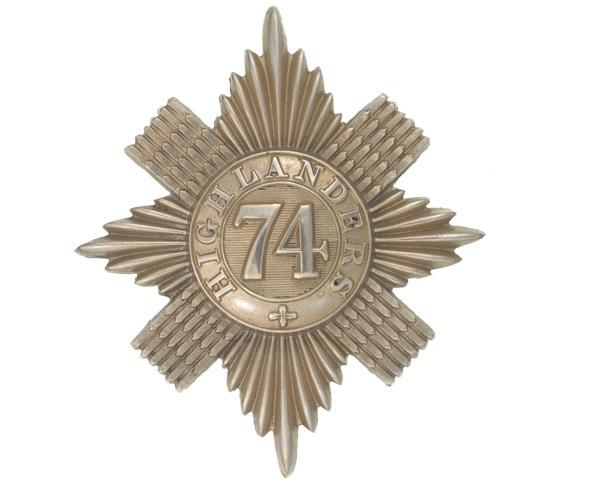 One of these was the 74th (Highland) Regiment of Foot, formed under Major-General Sir Archibald Campbell. It was sent to India just two years after its formation. While there, it fought in the Third Mysore War (1789-92), including the Battles of Bangalore (1791) and Seringapatam (1792), and the Second Polygar War (1800-05). Next, during the Second Maratha War (1803-06), it fought at Ahmednuggar (1803) and at Assaye (1803), where every officer in the regiment was killed. What was left of the unit had to be led out of action by its regimental sergeant-major. 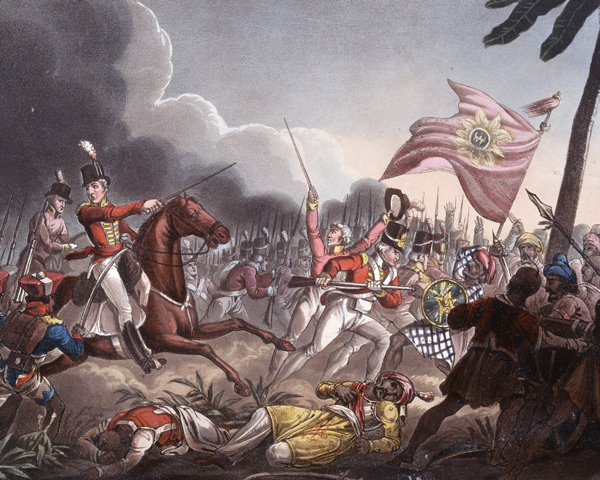 The East India Company awarded the regiment an honorary third colour for its 16 years in India, before it finally returned to Britain in 1805. The regiment then remained on home service until 1810, when it was sent to the Peninsular War (1808-14) for four years. It fought at Busaco (1810), Fuentes de Onoro (1811), Ciudad Rodrigo (1812), Badajoz (1812), Salamanca (1812), Vitoria (1813), Nivelle (1813), Orthes (1814) and Toulouse (1814). In Ireland at the time of Waterloo (1815), the regiment spent much of the following three decades in Canada and the West Indies. 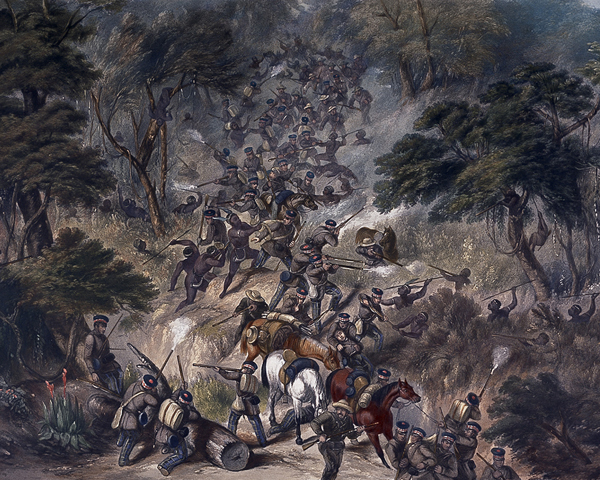 In 1851, it arrived in the Cape Colony (in what is now South Africa) for the Eighth Cape Frontier War (1850-53). When the troopship ‘Birkenhead’ foundered off the coast of southern Africa, the largest draft of new troops on board was intended for the 74th Foot. 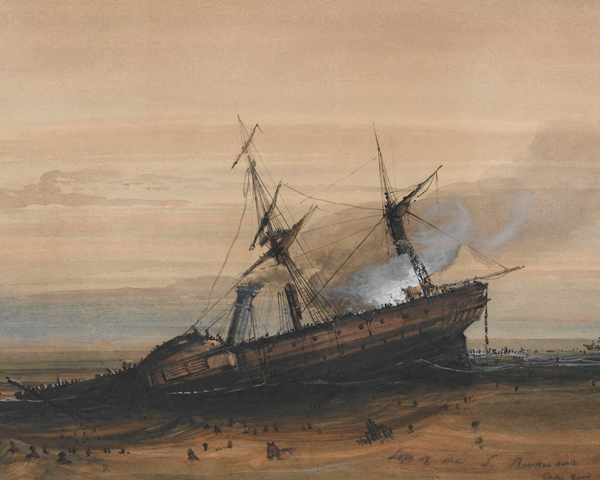 Their discipline on deck as the vessel sank - later known as the ‘Birkenhead Drill’ - allowed the women and children on board to be saved. The regiment moved back to India in 1854, remaining there for ten years and fighting during the Indian Mutiny (1857-59). The following two decades saw the 74th stationed in Britain, Ireland, the Mediterranean and Hong Kong. The regiment had returned to Britain by 1881, when it amalgamated with the 71st (Highland) Regiment of Foot (Light Infantry) to form The Highland Light Infantry. Explore the history and collections of the 74th (Highland) Regiment by visiting the Royal Highland Fusiliers Museum. This Scottish unit was raised in 1777. It served with the British Army until the 1881 reforms, when it became part of the Highland Light Infantry. This Scottish infantry unit was raised in the 1780s. It served with the British Army until 1881, when it was merged into The Black Watch (Royal Highlanders). This Scottish infantry regiment was raised in 1794. It served until the 1881 Army reforms, when it was merged into Princess Louise’s (Argyll and Sutherland) Highlanders.